Helen Caulton-Harris described Donna Blake as a pioneer of sorts. Indeed, she was one of the first African-American women to take an administrative role with the city of Springfield. But beyond that, she was extremely active within the community, working at the Urban League for decades, serving as a parks commissioner, and always advocating on behalf of children and their well-being. So it’s only fitting, then, that the small park named in her honor has become a symbol of sorts for turnaround efforts in the Old Hill Neighborhood of the city, and one of the focal points of a multi-faceted initiative called Healthy Hill. Not long ago, Donna Blake Park was a place to avoid — unless you were looking for drugs or trouble, which you could find easily and in large quantities. As a result, parents didn’t want their kids playing there. The park became a flash point, a symbol of everything that was wrong with that neighborhood, one of the poorest in the city — and the state. Today, though, the park is, well, what it was created to be — a resource, a gathering spot, a place to exercise, a haven within the neighborhood, especially for its young people. And it became all this largely because of the Healthy Hill Initiative, or HHI, as it’s known, an endeavor that epitomizes the term ‘collaboration,’ and was the clear winner in that specific Healthcare Heroes category. It does this through a number of initiatives, from indoor fitness activities for seniors through a collaboration with the YMCA of Greater Springfield and the Springfield Housing Authority, to C3 police efforts designed to build trust and supportive relationships, to a hugely successful program called Let’s Play that has involved more than 65 young people who participate in physical-fitness activities at Donna Blake Park at least two Saturdays a month. HHI is a large, very involved collaborative effort, with more than a dozen players. In addition to Way Finders (formerly HAPHousing), which took a lead role in the initiative, as did Partners for a Healthy Community, participating entities include Mercy Medical Center, Baystate Health, Revitalize CDC, the Old Hill Neighborhood Council, and six city departments, including Health and Human Services and the Police Department. These agencies were all working toward improving Old Hill before HHI was launched, said Caulton-Harris and others we spoke with. But this endeavor took them out of their respective silos and brought them into the same room — literally — and the same fight for better outcomes. Bur rather than talk about how it all came together and why, those involved were clearly more interested in discussing the many forms of progress it has yielded. Awilda Sanchez, vice president of the Old Hill Neighborhood Council and a 25-year resident of that area, said the changes are palpable. Certainly one of the more poignant measures of improvement is the relationship between young people and the police, as related by Beatrice Dewberry, manager of Way Finders. Those last few words take on new meaning in an age when the health- and wellness-related problems in society are large in scale, complex in nature, and require collaborative efforts if they are to be effectively addressed. So much so that, as BusinessWest talked with a large and distinguished panel of advisors as it was bringing the Healthcare Heroes program to reality, those individuals made it clear that a category devoted to collaborative efforts should be established. One was, and it drew a large and diverse mix of projects, all of which drive home the point that, when groups with common goals and ample amounts of energy, imagination, and persistence come together, powerful things can happen. Nowhere is that more evident than in Springfield’s Old Hill neighborhood, a once-proud (it’s getting back there) enclave of roughly 4,300 residents. Like many of Springfield’s neighborhoods, Old Hill, largely populated by Hispanics and African-Americans, has experienced years of disinvestment and complex challenges ranging from higher rates of poverty, lower graduation rates, an active drug trade, gang activity, higher rates of violent crime, and increased incidences of chronic disease and obesity, said Robinson. These matters were further complicated by the fact that the June 1, 2011 tornado tore across parts of Old Hill, causing considerable damage. With an eye toward addressing health- and wellness-related issues in Old Hill, a host of local agencies and city departments came together behind a common vision, he went on, adding that, in many ways, Peter Gagliardi, president and CEO of Way Finders, was the catalyst by bringing attention to the direct correlation between housing and health and essentially inspiring a call for action. Sarah Page says the Let’s Play initiative has brought children — and adults — back to Donna Blake Park, which for decades had been a place to avoid. “He pulled together 40 to 50 people in his office to talk about this connection,” said Caulton-Harris. “There was a recognition of the need to address this intersection of health and housing. The effort she referred to took the form of a proposal for the BUILD Health Challenge that was worthy of all those adjectives that make up that acronym (again, they’re ‘bold,’ ‘upstream,’ ‘integrated,’ ‘local,’ and ‘data-driven’). And the Healthy Hill Initiative certainly fits that description, said Page, noting that the HHI was clearly focused on those social factors, including everything from housing to public safety to neighborhood infrastructure and facilities — or the lack thereof. And the application efforts were certainly helped by the fact that there were already initiatives in place to help revitalize Old Hill, including a five-year strategic plan created after the tornado as well as Revitalize CDC’s plan to revitalize 10 blocks of the neighborhood over a 10-year period, an endeavor launched in 2012. 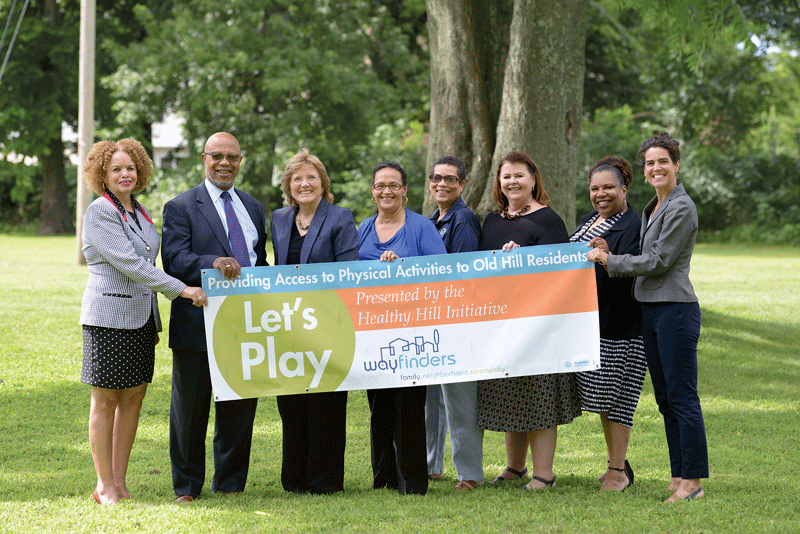 The initiative is also data-driven, said Jessica Collins, executive director of Partners for a Healthier Community, adding that her agency and others involved could look at maps of Old Hill and identify blocks where there were high incidences of asthma, obesity, and other problems. “It was exciting for us to be able to look at that granular level of health data,” she explained, noting that it was necessary to apply for the grant. “We had never done that before. “We had an amazing team working on data; information came from health clinics, the school system, and other sources, and then put through GIS,” she went on, adding that the Pioneer Valley Planning Commission and Baystate Health both worked to crunch the numbers. And they revealed that considerable work needed to be done, Dewberry said, adding that the accumulated data was used, along with considerable feedback from the community, to develop specific strategic initiatives, especially in the realms of physical activity and getting young people back out in the parks. But for that to happen, residents had to be convinced that the park was safe, and this took some doing, said Sanchez, adding the park was known as a place for gang recruitment and a host of illegal activities. Parental approval was required to get children to the park, she went on, adding that people went door to door to secure this approval. The resurgence of the park has had a transformative effect on the rest of the neighborhood, said all those we spoke with, adding that the return of children playing, the interaction between young people and police, and other positive developments have helped convince Old Hill residents that change is in the air — and they should be out in that air. Dewberry agreed, and told BusinessWest that, beyond a greater overall feeling of safety, the various components of HHI have contributed to creating a neighborhood that is in many ways better connected, something it has certainly not been historically. “We talk about social cohesion and building this unified, connected neighborhood,” she explained. “And a lot of what we’re doing with the Healthy Hill Initiative is working toward that end. Meanwhile, Healthy Hill Initiative has become a leading-edge example of how healthcare providers, moving beyond a fee-for-service model and into an accountable-care model, are taking on new responsibilities with regard to the health of the communities, and embracing that role, said Doreen Fadus, executive director of Community Health and Well-being at Trinity Health of New England and Mercy Medical Center. “From a hospital perspective, this initiative and others have changed the culture, especially of the leadership of the hospital,” she explained. “Instead of thinking that these are nice things that the hospital does, these are things we have a responsibility to do to make the neighborhood healthier. As Sanchez surveys Old Hill today, she sees less blight, she told BusinessWest, a direct result of many of the initiatives taking place in that neighborhood to rebuild properties and clear vacant lots once used as dumping grounds. But she also sees more green — in the form of flowers, new trees, and vegetable gardens — and, most importantly, more people, who obviously feel safe enough to walk, exercise, and get some fresh air. And with all that, she’s seeing a lot of what she left behind when she moved here from Puerto Rico decades ago. It came about because of determination, imagination, and, most importantly, collaboration. Returning to that story she told about the young boy living in the public housing project who once hated police but soon couldn’t wait to engage with them in the park, Dewberry said her agency has tons of pictures of police and young people playing together. Perhaps more than anything else, these images tell the story of how Old Hill is experiencing change and progress. Not so long ago, this neighborhood, and the park that has been at the forefront of so much that has happened, were the picture of disinvestment, the picture of a neighborhood in crisis. 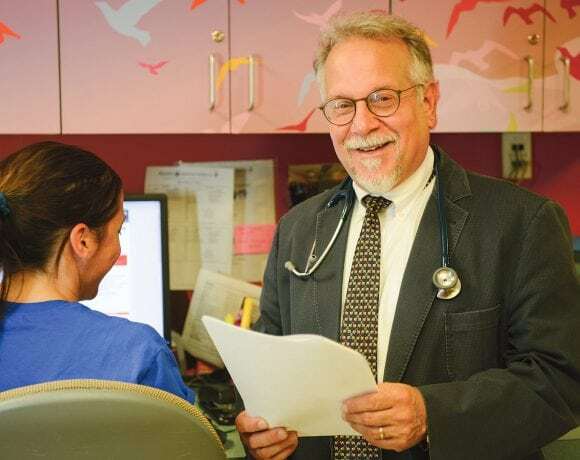 HHI has brought better times, and better health, into focus. And Donna Blake would certainly be proud.